Posted December 15th, 2018 at 6:25 PM (CST) by Bill Holter & filed under General Editorial. If one offered investors a fat tail put option that never decays or expires, costs about -1% pa to carry, has no counter party risk & no chance of ever becoming worthless, there would be a line out the door. But when one explains that this option is physical gold… no interest. Posted April 17th, 2019 at 2:58 PM (CST) by Bill Holter & filed under Jim's Mailbox. The moral to this story is liars and cheaters never prosper? Compared to this same week last year, the far-left CNN has lost a jaw-dropping 47 percent of its primetime audience and 41 percent of its total day viewers. TV News reports that this CNN’s worst week in prime time all year. MSNBC did not fare all that much better. During primetime, the left-wing outlet lost 28 percent of its viewers. Throughout the total day, MSNBC was down 20 percent. For those who believe this ratings drop has nothing to do with MSNBC and CNN being exposed after two years of deliberately pushing a hoax about President Trump colluding with Russia to steal the 2016 presidential election, I give you Fox News… Fox lost only lost eight percent of its primetime viewers and 12 percent of total day viewers. As far as news weeks go, last week might have been a little less exciting than this same week last year, but MSNBC, and most especially CNN, are shredding massive numbers of viewers for one primary reason… Both outlets spent two years lying to their audience, promising them Trump’s impeachment and arrest was coming up right after the next commercial break. Posted April 17th, 2019 at 2:52 PM (CST) by Bill Holter & filed under USAWatchdog.com. Please watch, post or forward if you wish. Posted April 17th, 2019 at 2:50 PM (CST) by Bill Holter & filed under In The News. The Global Economy Has Not Only Slowed, It’s Almost Stopped! 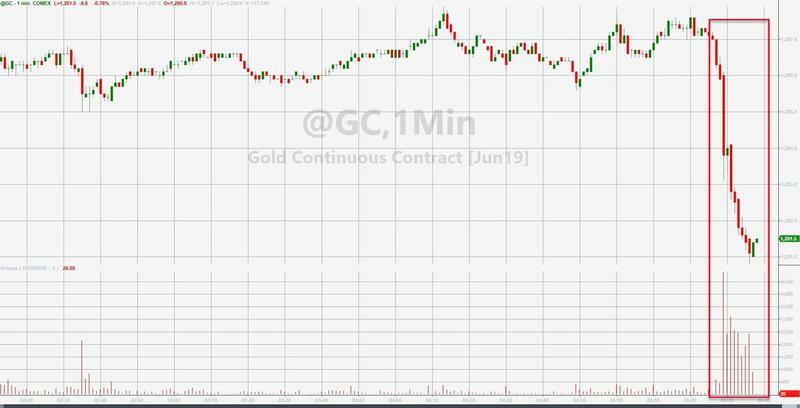 After all the days of morality beatings, we start this day of with a positive note with Gold trading higher at $1,278.10, up 90 cents after reaching $1,282.10 before the London button of control was pushed with the low right here at $1,276.80. Silver is trading higher as well at $14.942 up only 2.2 cents and at the low of $14.93 with the high so far at $14.99. It seems the US Dollar is getting more volatility then the precious metals are allowed with its trade at 96.575, down 7.7 points and up from its low at 96.46 with a high so far at 96.785. This is a 32.5 point swing with Silver doing 11.5 cents and Gold only a $5.30 swing all before 5 am pst and the Comex open. Apparently in Venezuela, Gold is still dropping hard in value with the latest pricing under a currency in heavy print at 12,765.02 Bolivar losing a whopping 89.89 overnight with Silver at 141.173 crushing Silvers price by 7.641 Bolivar. Amazing volatility, one day, it will be proven under the US Dollar, British Pound, and the Eurocurrency. April Silver Delivery Demands are still stuck at 1 with Zero Volume up on the board so far this morning. I watched all day yesterday to see if a fill would occur when a posted 28 count buy order was placed in the Bid at $14.945. It sat out there like a dead fish rotting in the sun all day long with no takers. Not that it matters anymore because it really does seem that the Comex pricing mechanism has become irrelevant when it used to be the place for real price discovery. The Open Interest in Silver continues to gain proving once again that the issues in Ag are only increasing the pressure under the lid as another 1,536 short trades are added into the Silver futures count now totaling 224,850 Overnighters in order to stay the price.. It proves pure and simple, this market is controlled, but only until there is no more physical to sell at this price. What’s amazing to me is how everyone who does not or never has traded in commodities, tells everyone else to stay away at the time when everyone should be salivating because of the manipulations and the slowing of physical extractions, and completely ignore the fact, that commodities are exactly where all the banks recover their losses when the time comes (Ag leverage at 5,000 ounces a contract). It really is frustrating to be in the commodities business when commodity firms are not allowed to talk openly, but everyone who doesn’t trade, disses the price mechanism everyone uses to quote. Who’s helping who by doing this? Posted April 16th, 2019 at 8:59 AM (CST) by Bill Holter & filed under In The News. Our early morning precious metals trading report starts off the same way it did yesterday, all trading lower with Gold leading the dip at $1,287.10, down $4.20 with the low at $1,285 and the high at $1,291.70. Silver is following along with its trade at $14.90, down by 7.5 cents with the low at $14.875 and the high at $14.975. The US Dollar is down as well, just like yesterday, with its value pegged at 96.555 down .001 of a point recovering from its low at 96.505 with the high at 96.705, all this was done way before 5 am pst and the Comex open. It seems the money manipulators have the entire gambit under wraps as we look into the emerging markets failed currency, the Venezuelan Bolivar, which has pegged Gold at 12,854.91 losing another 25.97 Bolivar overnight however Silver is trading at 148.814, a positive gain of .25 Bolivar. April Silver’s Open Interest remains at 1 and with zero Volume up on the board so far, unchanged from yesterday’s number. The biggest and most glaring issue in this pricing game is the fact that the manipulators have no fear what so ever about facing any penalties for breaking the laws regarding hedging positions as well as their antics with the EFP’s going into Britain. Silver’s Overall Open Interest continues to climb now totaling 223,314 Overnighters as 3,471 more shorts get added to the fray to stay the price, at the same time the Open Interest in one of the primary delivery months collapses early on, with the Open Interest in May just about ready to break down below 100k mark with the count now at 102,663 as the Options in the said month close out on April 25th and the last trading day for the paper longs in May leave on the 26th. One of these days, cheap prices will be fixed by cheap prices, it is the way all trading works, that is until recently. Posted April 16th, 2019 at 8:58 AM (CST) by Bill Holter & filed under Jim's Mailbox. President Trump always wants to know who’s behind everything; who’s manipulating news against him. Congress always wants to know who’s behind supporting Trump and who can prove false allegations against him. But no one, and I mean NO ONE, looks behind the curtain to expose the nefarious dealings in the gold market. It’s so obvious when you look at the timing and the manner in which contracts are sold. Even a child can see it! Manipulating gold is no different than manipulating the news to influence the public. It’s a form of propaganda with its agenda hidden from the public’s eyes. Goebbels, the Master Propagandist, would be proud. People should demand to know. Just like they should demand to know what the FED is involved with. Anything that affects our country and concerns the public’s money, should have full transparency. Imagine if corporations were to manipulate their numbers! Oh wait……. Posted April 15th, 2019 at 9:38 AM (CST) by Bill Holter & filed under Bill Holter. A couple of topics for you today that are connected, obvious, yet not understood or even contemplated at this point. First, have you ever wondered why the names of many fiat currencies refer to “weight”? Such as the Peso, Peseta, Lira, or Pound amongst many others? This is similar to the names of various roads, like “Saw Mill Rd.”. It was named that because years ago there was actually a sawmill down the lane. These fiat currencies with “weighty” names started out as receipts for either gold or silver. They were convertible into a specific amount of metal when presented at a bank. In essence these currencies were representations of physical metal since they were redeemable but far easier to carry around due to the lack of weight. In today’s jargon, paper currencies that were redeemable in specie were “derivatives” of the metals themselves. Then as time went on, the redeemability was cancelled and the currencies became true fiat, unbacked by anything except the credit worthiness of the issuer. Over time, ALL currencies have become fiat and these currencies steadily devalued. I would ask, how can anyone have the thought these currencies can gain value versus gold or silver over a long period of time if they were originally spawned as derivatives? Can a derivative ever become more valuable than that it originated from? The answer of course is no and should be followed by another question; can a monetary guarantee from any government ever be more ironclad than that of physical metal itself? Posted April 15th, 2019 at 7:49 AM (CST) by Bill Holter & filed under In The News. We open up our week with our usual starting point, precious metals trading weaker with Gold leading the drop at $1,289.70, down $5.50 with the low at $1,287.70 and the high to beat at $1,295.20. Silver is down 8.8 cents at $14.875, 2 cents off its low with its high at $14.95. With the precious metals under control, the US Dollar should be doing something different but alas, it’s following the precious metals lower with the value now pegged at 96.47, down 12.8 points with its low at 96.415 and the high at 96.58. Of course all this was done way before 5 am pst and our Comex open. 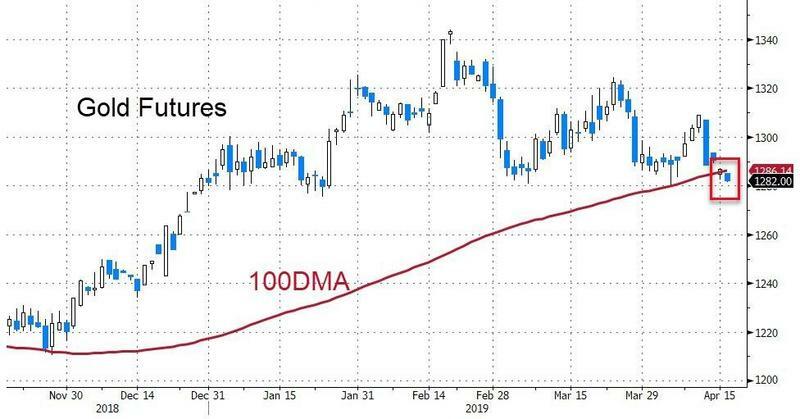 Our emerging markets view within the Venezuelan currency now has Gold pegged at 12,880.88 Bolivar, losing 59.92 over the weekend with Silver now at 148.564 losing .949 of a Bolivar as these gyrations swing hard and fast, but not in the primaries, yet! April Silver Deliveries have been something to view over the past few weeks, but not today, as the Demands for Physical stay at 1 and with zero Volume up on the board so far this morning. Silver’s Overall Open Interest has been climbing a huge wall of worry with the early morning count still showing 219,843 Overnighters are still in play proving only 512 positions got out before the weekends trade. This is where we think all price issues will be corrected. The exchanges will run out of physical at these below production prices, however these trading hubs, will have to prove they are still a viable way of getting product and real price, or they will be blown apart and blockchained into correction, if they survive at all. Britain is now being labeled a rogue state – “a nation or state regarded as breaking international law and posing a threat to the security of other nations.” The list of reasons are well defined in this article but it misses the most treasonous reason, the intervention into our election process here in the states, making many other nations wonder what else Britain has done for the sake of a crown? It seems we have much more to discover, especially since the City of London has been heavily involved with the Comex EFP’s in precious metals going to London for well over 2 years using this so called “emergency procedure”. We hope its only paper being sent over and not the physicals, time will prove all and now we wait for this weekend’s update on the special “U.S., European Banking Union, and UK Officials Meet for Planned Coordination Exercise on Cross-Border Resolution Planning” and it’s outcome which no one has followed up on yet. Oh to be the fly on the wall there! Posted April 14th, 2019 at 5:45 PM (CST) by Bill Holter & filed under Jim's Mailbox. For every action there is an equal and opposite reaction…! This story got no coverage. Page queried in 0.709 seconds.